All guitar students have challenges but what makes the difference in the end is their dedication to practice. Some students may have poor rhythm where others might be unable to clearly distinguish pitch or a thousand other factors. No one guitarist is strong in all areas and therefore need to practice to over come their personal weaknesses. In a sense we are all equal players. On your journey to guitar mastery you will likely meet other guitarists who seem naturally gifted in areas where you struggle but on closer inspection what separates great guitar players from the rest is consistency. When I come across guitarists who shine in areas I find difficult I see it as a great opportunity to watch and learn. My mission is to understand how they perform so effortlessly what I find challenging. In some cases the guitarist had a particular interest in a certain skill. One example is sweep picking. I remember years ago the first I saw Frank Gambale sweep picking and it was unbelievable. His hand hardly moved and in a split second he ran through an arpeggio with what seemed like perfect precision. Frank went on to explain that it took him years of practice to perfect sweep picking so I went home, practiced for a few weeks and got annoyed because it wasn't happening. Even though Frank had clearly said it took years I somehow wanted a result within weeks. There are no shortcuts and it was then I realised that only though years of consistent practice would I ever be able to sweep pick like Frank. As a teacher I became passionate about what made great guitar players great and the conclusion was not just practice but consistent practice. In almost every case I found that the more consistent a student was with practice the more quickly they advanced. Some students would have a good week followed by a bad week or two followed by another good week but the result was almost always the same. These students would eventually give up or simply not progress. It was the students who were consistent about their practice that ultimately progressed. 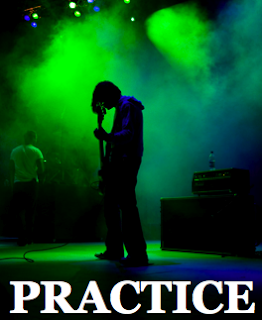 Consistent practice allows you to get a feel for your practice. If you do say 30 mins a day you learn how to use that time. If you practice 90 mins one day and then miss the next two days you will not get the same result. The inconsistency does not allow you to form the habit. Almost anything you are good at is a habit. E.g. speaking, reading, walking, using a computer, brushing your teeth etc. These are all habits. I know I am pointing out the obvious but I say this because time and time again I see students learning guitar who are frustrated because they are not progressing quick enough yet their practice is inconsistent. The answer to their frustration is clear yet they fail to recognise their lack of consistency. Some students see the guitar like riding a bike. After a few attempts they expect to be sounding like Santana. Unfortunately it takes time to get your guitar to sound like it should. Your main aim should be to establish a consistent practice routine.